Over the past few days, when I wasn't scratching my eyes out or when I wasn't fighting to keep myself awake (stupid sinuses!! ), I have been having this overwhelming need to do craft activities that don't involve knitting. Since my hands have been feeling a little sore lately I thought I would give in to these crafty urges. Why not, right? The thing is, I had no idea what kind of crafting I wanted to do. Should I sew? Should I bake? Should I try cross-stitching again? What about some sort of paper craft? What?? I had no clue. So I figured first things first: I should go through my sewing and crafting supplies and check out what I had on hand. Yeah...doing such a thing made me realize that I really needed to do some serious KonMari action in my sewing closet. Yikes! That first day was spent pulling stacks of boxes and piles of bags out of the closet. Which was probably a good thing as I discovered that I had an insane amount of foam brushes (why? Your guess is as good as mine) and that all of my glues had either dried up or solidified. I should still go through all these boxes and bags, as I'm sure there's more stuff that probably is no longer good and/or usable, or stuff that I most likely don't need to purchase any more of (like foam brushes). Nothing amongst my crafting supplies really piqued my interest, but as I was going through a massive pile of papers (seriously, paper clutter is my numero uno nemisis!!) I found a printed off pattern for a quilt block. Hmmm... Then I came across another pattern for a quilt that I've been wanting to make but think is too advance for my beginner quilter skills. And then I came across yet another pattern for a quilt that I've been dying to make, and conveniently have all the fabrics for, but didn't have the confidence to sew up just yet. Double hmmm... It seems that my crafting interests are veering towards my first true crafty love: sewing. Again, I went through my supplies and fabrics to see what I had to work with, seeing how a few of these projects involved scraps. It's funny how much time you can spend arranging and rearranging tiny pieces of fabric trying to come up with colour combinations and print placements. Then I realized that my supply of rotary cutter blades was dangerously low. So Michaels I went. I'm only mentioning this quick trip to Michaels simply because it actually was a quick trip. Get this: I went to Michaels and left with ONE item - the item I had intended to get!! Crazy, right? Normally I walk up and down the aisles (BIG mistake! ), ponder if I need a skein of Thick & Quick for something (I usually don't), ohh and ahh over scrapbook paper items (even though I don't scrapbook), and try to convince myself that I don't need a quarter of the items in the baking department. Although, I did spy jars of Mod Podge that I was extremely tempted to pick up. Back in the day (like, back, back, back in the day...high school days, to be exact), I used to sit at the kitchen table at my parents' house and for hours pour over magazines (mainly fashion) and catalogs (remember Delia's, anyone?) and put together endless collages in my sketchbooks. Soon I was covering any surface that my parents would let me cover. My most favourite item that I Mod Podged was an unused Kaboodles case (remember when Kaboodles were such a huge thing?) that I meticulously covered in Archie comics. Growing up, I was a massive fan and avid reader of Archie comics and had accumulated quite the collection of Double Digests. I had tediously gone through every.single.comic.book to find my favourite comic strips. It was a lot of work, but sooooo satisfying. I still have that case today (if you want to see it, check out this super old post). Anyhoo, back to the sewing. Before I started my first attempt at paper foundation piecing, I had to fiddle with my bobbin tension a little and so I started a super simple mug rug made from fabric selvedges that I've been saving for years. I didn't have any proper quilting batting but I did have some heat-resistant insulation padding stuff (why? Good question) and decided to just use it. It was quite therapeutic to sew those strips together with no real action plan to adhere to. That's when I realized that it has been YEARS since I've done any selfish sewing. Yeah, I've made project bags but the ones that I've kept for myself were the rejects. Ok, except for one of the Halloween themed ones...that one was too cool to pass up. But otherwise, I did absolutely NO sewing for myself. Nothing. The more I stitched away on that mug rug, the more I gave it some thought and then came to a conclusion: I didn't have any balance when it came to my sewing. I didn't sew for me. Just project bags and garment alterations for others (which I completely detest doing). Then for the longest time I hated sewing and even hated being behind my sewing machine. I dreaded having to make more project bags. The fun was zapped out of me. I was burnt out. I was unhappy. 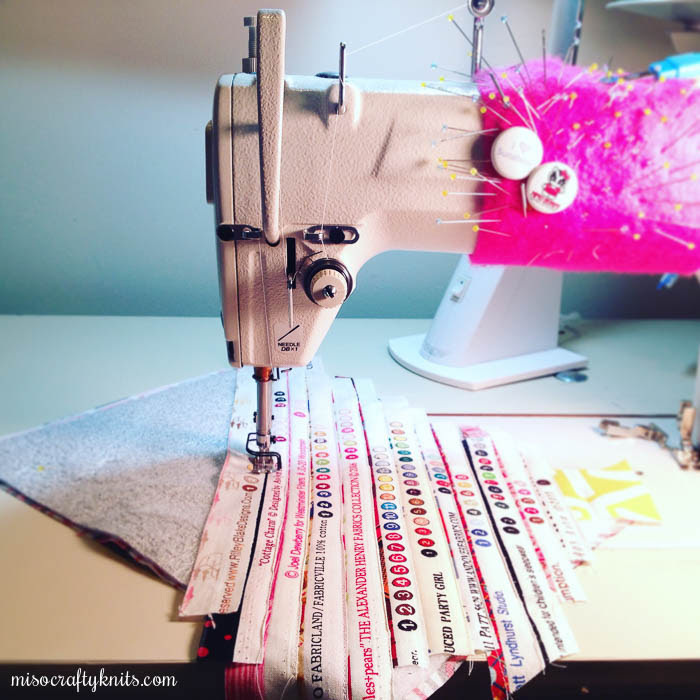 Every time I even thought about sewing something for me, I was overcome with feelings of guilt. Like I had no right to sew for myself when I had customer requests, custom orders to fill, a shop to stock, and garments to hem. Towards the end of the mug rug, I was still dealing with feelings of guilt. But you know what? My love of sewing was slowly coming back to me. I was actually experiencing feelings of joy about using my sewing machine. When I finished the main part of the mug rug, I decided to move onto the paper foundation piecing project (which was great fun...and quite the learning experience for me!). Sewing up the Love Wins quilt block was not only a learning experience, but also a therapeutic one. I thoroughly enjoyed every second of it. I wish I could say that when I was finished sewing the block top that the feelings of guilt went away. They didn't. But I was starting to enjoy sewing again. And to me, that's a HUGE step in the right direction. Moral of the story: You need to find balance. In everything you do. Now I just need to remember this. Constantly. I'm looking into getting my serger serviced so that I can maybe whip up a few summer dresses. In the meantime, I'm looking forward to hand sewing the binding on my mug rug and finding a fun fabric for the back of my block. AND I've got a handful of project bags in the works! Wow. Sewing. Welcome back into my life, old Friend. I had a Kaboodles too! It was a metallic green. I used to devour Archie comics. I fondly remember buying some when we were on the ferry to Vancouver. I love Michael's also. I walk down aisles and eyeball so many things, but I've been good, telling myself I need to experiment more with shrink film and the beads we have. That quilt corner is awesome. I love this post. 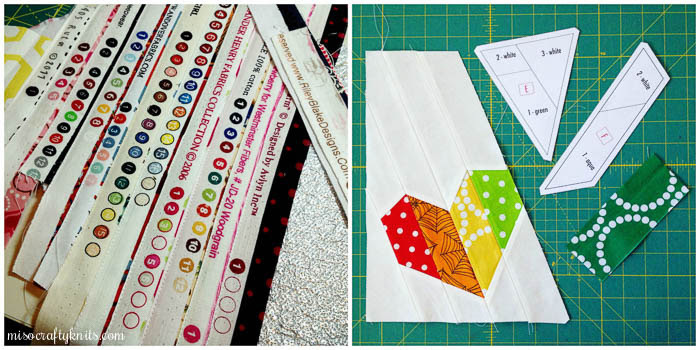 I totally get the same way with sewing projects that are a "chore" verses what I want to do! :) I highly recommend some knit/jersey summer dresses! I just made one for my daughter, and it was easier than I expected!